Copper declined again on Thursday dipping to $2.7075 a pound or $5,970 a tonne on the Comex market in New York in massive volumes with contracts totalling 1.3m tonnes worth $7.8 billion changing hands by lunchtime. Copper is now down more than 18% or $1,380 a tonne since hitting four-year highs early June. Fears over the impact of a US trade war with China, responsible for half the world's metal consumption, overshadowed news that workers at the world's largest copper mine are planning to down tools for at least 30 days if part-owner operator BHP doesn’t agree to their demands. BHP, the world's fourth largest copper producer, said on Thursday it had begun to review contingency plans ahead of a possible strike at Escondida in Chile, responsible for nearly 5% of primary global copper supply. Melbourne-based BHP said in a statement that the wage offer rejected earlier on Thursday by the union was the "best collective labor contract at a private mine in the country." The union responded by saying the company should improve the offer by Monday August 6 or it will start gearing up for a strike. Yesterday union No. 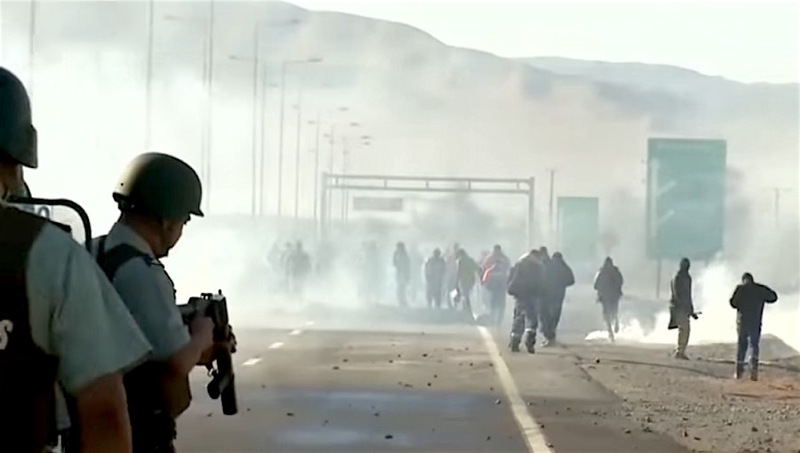 1 President Patricio Tapia said in an interview with Bloomberg a strike at the mine won’t be a short one. The wage offer rejected earlier on Thursday by the union was the "best collective labor contract at a private mine in the country"
Workers plan to use a provision in Chile’s new labor code to retain benefits. After 30 days, some would return to work individually, effectively accepting the company’s last offer. Others would stay on strike, allowing the union to call for an 18-month extension of the previous contract. Then the union representing all workers, including those who abandoned the strike, would negotiate using the previous contract and all of its benefits as the starting point. Chile’s labor authority questioned the strategy in a letter Tuesday, saying workers who abandon the strike individually would have to negotiate after 36 months and can’t be part of a collective negotiation. The union remains confident the strategy is valid, Tapia said. Management and workers could engage in five additional days of talks mediated by labor authorities, which could be extended for five more days. If no agreement is reached, a strike would start around mid-August. The union is demanding a one-time bonus equivalent to 4% of dividends distributed to BHP shareholders in 2017 for a total of just under $4 billion (25.6B pesos). That works out to about $34,000 per worker and compares to the Anglo-Australian firms final offer of a bonus of nearly half that figure (13.5B pesos). A 44-day strike in February-March last year crippled production at Escondida, which BHP expects will produce more than 1.2m tonnes in 2018. Earlier this week workers at Chuquicamata, Codelco's second largest mine with output of more than 330kt last year, downed tools and blocked access to the property over a dispute with management. On Tuesday the main union at Chile's Caserones mine expected to produce 110kt this year rejected operator Lumina Copper's final wage offer. Together with Escondida, the Chilean operations under threat of labour action have a capacity of 3m tonnes per year or nearly 15% annual global output.